Learn about Aruba by reading Aruba—Little Island, Big Adventure by Charlie Spence, Travel Writer. It features a mini, but thorough tour of the destination, plus all you'll need to know to plan your trip including getting there, objective information on places to stay and eat, and things to do. At the end of the article, we've provided a summary of the contact information for your easy reference. Enjoy! Divi tree on the beach. It covers only 70 square miles of land and has a year-round average temperature of 82˚ Fahrenheit, is rimmed by sparkling beaches and quiet, more-secluded shady expanses, has nights crammed with excitement, and food to delight even the most discriminating palate. It is everything you look for in a getaway trip any time of the year. Aruba is only a few miles from Venezuela over waters of the Southern Caribbean. It is a quick flight from Miami in the United States and is served by a number of airlines with connections to almost anywhere in the world. Aruba is a place where you can do everything from relaxing and unwinding in the splendor of plush resorts through explorations of any of the more than half-a-dozen shipwrecks off the coast. Do your own exploring of the waters or take guided tours. Parasailing, scuba diving, wind and kite surfing, deep sea fishing, underwater tours—select your adventure. About 100,000 persons live on the island but six times that many come annually as visitors. The small island attracts so many visitors they are limited as to the length of their stays and the number of times they may visit is a year. Maximum time for a single visit is 30 days and cannot exceed 180 days a year. While this may seem ample for exploring and enjoying the island, visitors soon find it difficult to sample what the destination offers in those short times. Lovers of water sports have only one problem—deciding which activity to enjoy next. Aquatic adventures seem almost endless. Little rainfall and daily sunshine matched with the variety of beaches make Aruba a place to spend hours of tanning interspersed with refreshing dips in the turquoise Caribbean waters. Resorts line much of the seven mile strip along the west coast. Soak up sun, enjoy a book, or delve into any one of the other adventures. Swimming, water skiing, parasailing, tubing, kitesurfing, and banana-boating, are just a few steps away. Experienced divers may plunge to explore one of the shipwrecks where the visibility is up to 100 feet in the clear waters. Explore the reefs. If you haven’t yet mastered snorkeling, Aruba is your opportunity to take training and get certified. If you are not ready for scuba diving, try snuba, that is a combination of SNorkling and scUBA which lets you breathe easily underwater without wearing heavy underwater gear. Beaches along the windward coast are in contrast with secluded coves and less developed areas. You will find great beauty with views of the Caribbean and more privacy along that side of the island but because of the strong undertow, swimming is not recommended. Cruises offer a time to either relax or revel. Some departures take you on romantic moonlight interludes; others rock the boat with a party atmosphere. If you like the water but don’t like getting wet, go aboard the famous Glass Bottom boat, the Sea World Explorer, or the Atlantis Submarine. Any of these will take you to the Antilla shipwreck. Don’t get the idea you will become waterlogged on a visit to Aruba. Much is available on dry land. Enjoy a leisurely horseback ride along the beach or hike along the twenty miles of rugged trails in the Arikok National Park. Golfers will find new challenges playing against the constant trade winds. Want to relax even more? Tour the island in an air-conditioned motor coach or on a jeep safari. Aruba nights are as diverse and enticing as are the day attractions. Scores of casual beach and pier bars are along the southwest coast where you may mingle with the locals and other tourists. For nightlife, you will have about a dozen casinos from which to choose. Some are open 24 hours. At some you will find Las Vegas-type shows. You can find state-of-the-art slot machines, a wide range of table games, cash Bingo and other games of chance. Main entrance Paseo Herencia Mall & Entertainment Center. 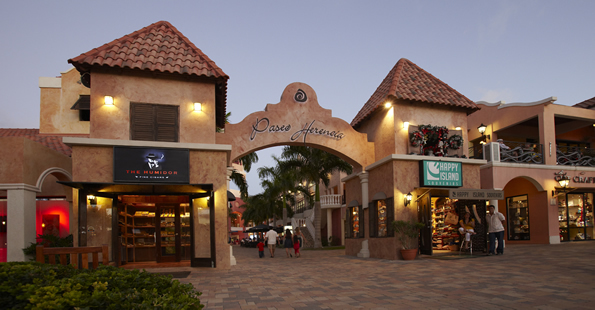 The capital city, Oranjestad, has the stores and boutiques but you will also find shops in the major hotels and at the airport. Select from a wide verity of international brands with prices in Aruba usually 10-35 percent lower than they are in the United States. Oranjestad is the historic Dutch city with its tall structures, government buildings, the multi-colored houses with their carved wooden doors and traditional Dutch tiles. Another area known as the Highrise strip also has many shops, malls, after-hours haunts, karaoke and martini bars, theaters, cafes and restaurants. Cuisine on Aruba has been developed from an abundance of seafood so many of the dishes you will enjoy include mahi-mahi, tuna, wahoo, conch, or snapper. Traditional meals are accented by native herbs and spices. 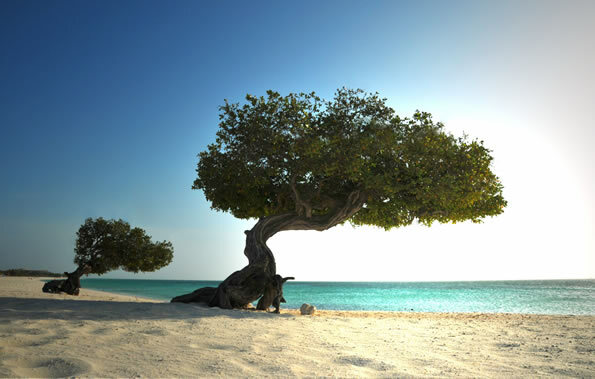 Until January 1, 1996, Aruba was a part of the Netherlands Antilles. At that time it became a separate entity within the Kingdom of the Netherlands. The Governor is appointed by the Queen. The official languages are the native-tongue, Papiamento, and Dutch. English and Spanish are also widely spoken and almost universally understood. Aruban florin is the official currency. It is divided into 100 cents. The United States dollar is widely accepted but many places will not accept the $50 or $100 bill because of world-wide counterfeiting. Travelers with ATM cards can withdraw cash in U.S. dollars but before starting on a trip, one should check with the home bank if their cards will work in Aruba. Major credit cards are accepted at most locations. U.S. citizens will be required to have a valid passport. Some countries require a visa to enter Aruba. Many airlines serve Aruba with arrivals at the modern Queen Beatrix International Airport. By air the island is only two and one half hours from Miami, Florida. Other cities in the United States with direct service to Aruba are New York City, Boston, Washington, D.C., Chicago, Philadelphia, and Hartford. Many airlines offer direct flights from other nations. Connections can be made from almost any place in the world. As this is written, some of the places from which direct flights are available include Colombia, Santo Domingo, Curacao, Netherlands, England, Panama City, and Venezuela. In addition, Aruba has become a popular stopover port for cruise ships. Each year more than half a million tourists disembark from cruise ships. Accommodations are as diverse as the Island itself. Options include small, intimate hotels to those with hundreds of rooms, including plush suites. Most are along the beach. Make your reservations before you go through WTA’s Online Travel Booking Service. Significant hotel and car rental discounts may apply. Visitors to Aruba will find many restaurants offering a wide variety of selections for international cuisines. More than 100 international restaurants are available offering cuisines ranging from French, Italian, Indonesian, Chinese, Japanese, and, of course, local dishes. Many restaurants offer dine-around programs or early bird specials so you may taste the different availabilities. Many fine restaurants are in the hotels. A variety of fast-food establishments are in handy locations. Notice: This information is current as of April 2011. It is recommended that you contact the numbers, and/or visit the websites above to determine any changes to the information.